Welcome to the Online Canadian Paper Money Museum! Another handful of exhibits have been added to the Museum! 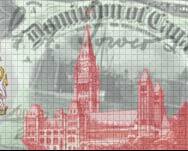 This website was designed by a Canadian Paper Money collector as a means to collect together in one place many examples of rare and exotic notes, tales of amazing finds, sets of notes, pictures of notes with special serial numbers and more. This website is organized into a series of collections, each containing numerous exhibits. All exhibits illustrate notes which are privately owned by collectors of Canadian paper money. In some cases, the owners wish to remain anonymous. Otherwise, either the full name, or an online alias of the owner is displayed alongside a writeup and explanation of the exhibit. For more information about the notes contained in this online museum, please visit the Canadian Paper Money Forum, located at http://www.cdnpapermoney.com. There, you can meet collectors from across Canada and around the world and learn as much as you want to about Canadian Paper Money. The primary organization that brings Canadian collectors together is the Canadian Paper Money Society. You can visit their website at http://www.cpmsonline.ca. To inquire about listing your own exhibit on this website or for any other technical matters, please contact the webmaster by emailing bwjm@bwjm.ca. Begin your visit to the Museum by selecting any of the categories along the top or bottom of the page. Thanks for visiting the Online Canadian Paper Money Museum and enjoy your stay! This website is not affiliated with the Government of Canada, the Bank of Canada, or the National Currency Collection in Ottawa, Ontario, Canada. All banknote images are reproduced with permission from the owners of the notes and the Bank of Canada (where applicable) and all images comply with Canadian copyright, banknote reproduction and anti-counterfeit legislation. For more information, click here. This website is Copyright © 2002-2009 Brent W.J. Mackie. No part of this website may be reproduced without explicit written permission.